Some tropes are so ingrained in Medieval-inspired fantasy stories that it's tempting to think that they represent real aspects of Medieval life. But often these stories are just reinforcing myths and misconceptions about life in the Middle Ages. 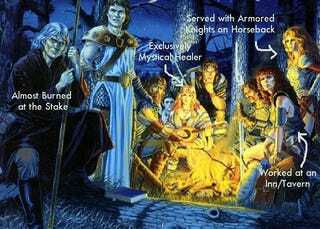 Top image from the Dragonlance series, which I love, but is steeped in pseudo-Medievalism. One thing that it's important to remember when talking about the Medieval period is that it spans a long time — from the 5th century CE to the 15th century CE — and involves a great number of European countries. You'll notice that a great deal of the debunkery here involves 14th century England, thanks to works like The Time Traveler's Guide to Medieval England by Ian Mortimer and the works of Joseph Gies and Frances Gies (although another source, Misconceptions About the Middle Ages, covers a bit more ground). But the point here is that the Middle Ages were, in fact, far richer than the Medieval-like settings of many swords and sorcery stories would lead you to believe. Do fantasy novels need to be historically accurate? Certainly not. Part of the fun of worldbuilding is inventing new ideas, or combining elements of different cultures and time periods, and even integrating historical myths and misconceptions. But If you read a lot of books or watch a lot of movies with pseudo-Medieval settings, you may come away with a mistaken impression that you know what life in the Middle Ages was like. Plus, real history offers new ideas that you might want to incorporate into your own stories in the future. And this is not to say that all Medieval-esque settings slip into these myths; only that many, many do. 1. Peasants were a single class of people who were more or less equal to one another. It's easy to think that people in the Middle Ages were easily divided into very broad classes: royals, nobles, knights, clergy, and toiling peasants at the very bottom. But just because you didn't have "king," "lord," "sir," "father," or "brother" (or their female analogs) in front of your name doesn't mean you weren't concerned with your own social standing. There are vast classes of people whom, today, we might generally refer to as "peasants," but there were actually various classes of people within that broad category. Mortimer points out that, in 14th-century England, for example, you have your villeins, people bonded to a particular lord's land. Villeins were not considered free folk, and they could be sold with the lord's land. And free folk were of a variety of social and economic classes. A freeholder, for example, might become successful enough to rent a lord's manor, essentially acting as a lord himself. And, in a village, a few families might hold the majority of the political power, supplying most of the local officers. We may tend to think of these people as "peasants," but they had much more complicated ways of thinking of themselves, with all the class anxiety that goes with that. 2. Inns were public houses with big common halls below and rooms above. There are few images as firmly rooted in pseudo-Medieval fantasy as the tavern inn. You and your party enjoy a few flagons of ale in the main room, hear all the local gossip, then go up to your private rented chamber where you'd sleep (alone or with a lover) on a lumpy mattress. That image isn't wholly fiction, but the truth is a bit more complicated — not to mention interesting. In Medieval England, if you combined a city inn with an alehouse, you'd probably get something resembling that fantasy inn. There were inns where you could rent a bed (or, more likely, a space in a bed), and these inns did have halls for eating and drinking. But these were not public houses; innkeepers were generally permitted to serve food and drink only to their guests. And, Mortimer points out, you would likely find a single room with several beds, beds that could fit up to three people. It was only in the most upscale inns that you'd find chambers with just one or two beds. There were establishments for drinking in these cities as well: taverns for wine and alehouses for ale. Of the two, alehouses were the rowdier establishments, more likely to function as your Medieval Mos Eisley. But ale and cider were often made at home as well; a husband might expect his wife to be skilled in brewing. The Gieses note in Life in a Medieval Village that a tavern in an English village was often someone's home. Once your neighbor opened up a fresh batch of ale, you might go to their house, pay a few pennies, and sit and drink with your fellow villagers. There are other options for accommodations as well. Travelers could expect the hospitality of people of equal or lesser social class, enjoying their food and beds in exchange for tales from the road and a tip. (Mortimer says that, if you were lucky enough to stay with a 14-century merchant, the digs were much nicer than any inn.) Or you might go to a hospital, which was not just for healing, but also for hospitality. 3. You would never see a woman engaged in a trade such as armorer or merchant. Certainly, some fantasy stories will cast women in equal (or relatively equal) positions to men, carrying out the same sorts of trades that men might carry out. But in many fictional stories, a woman who makes armor or sells good would seem out of place — although this does not universally reflect Medieval reality. In England, a widow could take up the trade of her dead husband — and Mortimer specifically cites tailor, armorer, and merchant as trades open to widows. Some female merchants were actually quite successful, managing international trading ventures with impressive capital. Image from the Holkham Bible Picture Book, via the British Library Board. 4. People had horrible table manners, throwing bones and scraps on the floor. Sorry, even in the Middle Ages, members of polite society, from kings to villeins, followed certain etiquette, and that etiquette involved good table manners. In fact, depending on when and where and with whom you were eating, you might have to follow very strict procedures for eating and drinking. Here's a tip: If a lord passes you his cup at the dinner table, it's a sign of his favor. Accept it, backwash and all, and pass it back to him after you've had a sip. 5. People distrusted all forms of magic and witches were frequently burned. In some fantasy stories, magic is readily accepted by everyone as a fact of life. In others, magic is treated with suspicion at best or as blasphemy at worst. You might even hear the Biblical edict, "Thou shalt not suffer a witch to live." But not all claims of magic in the Middle Ages were treated as heresy. In her essay "Witches and the Myth of the Medieval 'Burning Time,'" from Misconceptions About the Middle Ages, Anita Obermeier tells us that during the 10th century, the Catholic Church wasn't interested in trying witches for heresy; it was more interested in eradicating heretical superstitions about "night-flying creatures." And in 14th-century England, you might consult a magician or a witch for some minor "magical" task, such as finding a lost object. In Medieval England, at least, magic without any heretical components was tolerated. Eventually, the late 15th century would give rise to the Spanish Inquisition, and we do see witches hunted down. Witch burnings weren't unheard of in the Middle Ages, but they weren't common, either. Obermeier explains that, in the 11th century, sorcery was treated as a secular crime, but the church would issue several reprimands before it would resort to burning. She puts the first burning for heresy at 1022 in Orleans and the second at 1028 in Monforte. It's rare in the 11th and 12th centuries, but becomes a more common punishment in the 13th century for relapsed heretics. However, it depends where you are. In the 14th century, you probably won't be burned as a witch in England, but you may very well get the stake in Ireland. 6. Men's clothing was always practical and functional. Yes, Medieval people of various classes were interested in fashion, and sometimes fashion — particularly men's fashion — got pretty absurd. Early clothing is more functional, but during the 14th century, men's fashions in England were both body-bearing and rather experimental. Corsets and garters were common for men, and increasingly, popular fashions encouraged men to show off the shape of their hips and legs. Some aristocratic men wore gowns with sleeves so long they were in danger of tripping on the cuffs. It became fashionable to wear shoes with extraordinarily long toes — one such shoe, imported from Bohemia, had twenty-inch toes that needed to be tied to a man's garters. There was even a fad of wearing one's mantle so that the head went through the arm hole rather than the head hole, with the sleeves functioning as a voluminous collar. Image: Selection of Medieval leather shoes from the Museum of London. It's also important to note that fashions would trickle down from royalty, through the aristocracy, and down to the common folk. In the seasons after a fashion appeared among the nobility, a less expensive version would appear among those of lesser stations. In fact, sumptuary laws were passed in London to prevent people from dressing above their stations. For example, a common woman in 1330s London was not permitted to line her hood with anything but lambskin or rabbit fur, or risk losing her hood. 7. Servants were all low-class people. Actually, if you were a high-ranking individual, chances are that you had high-ranking servants. A lord might send his son to serve in another lord's manor — perhaps that of his wife's brother. The son would receive no income, but would still be treated as the son of a lord. A lord's steward might actually be a lord himself. Your status in society isn't just based on whether or not you were a servant, but also your familial status, whom you served, and what your particular job was. Something you might not expect about servants in English households in the late Middle Ages: they were overwhelmingly male. Mortimer points to the earl of Devon's household, which had 135 members, but only three women. With the exception of a washerwoman (who didn't live in the household), the staffers were all men, even in households headed by women. 8. Medicine was based on pure superstition. Admittedly, if you're looking outside of Game of Thrones, a lot of healing in fantasy novels is just plain magical. You've got your cleric class who gets their healing from the gods, and otherwise you might have someone on hand who can dress a wound or make a poultice. And yes, a lot of Medieval medicine was based on what we would consider today mystical bunk. A great deal of diagnosis involved astrology and humoral theory. Blood letting was a respected method of treatment, and many of the curatives were not only useless — they were downright dangerous. And while there were medical colleges, extraordinarily few physicians were able to attend. Still, some aspects of Medieval medicine were logical even by modern standards. Wrapping smallpox in scarlet cloth, treating gout with colchicum, using camomile oil for an earache — these were all effective treatments. And while the notion of a barber-surgeon is a horrifying one to many of us, some of those surgeons were actually quite talented. John of Arderne employed anesthetics in his practice, and many surgeons were skilled in couching cataracts, sewing abscesses, and setting bones. From John Arderne's De arte phisicali et de cirurgia, via Wikimedia Commons. 9. The most powerful military force consisted of armored knights riding into battle. James G. Patterson, in his essay "The Myth of the Mounted Knight" from Misconceptions About the Middle Ages, explains that while the image of the mounted knight might have been a popular one during Medieval times, it didn't match the reality of warfare. Armored cavalry, he explains, can be incredibly useful — even devastating — against untrained revolutionaries, but they were far less useful against a trained foreign infantry. Rather, ground forces, including knights on foot who frequently served as officers, were invaluable in battle. Even during the Crusades, when the image of the mounted knight seemed synonymous with glory in battle, most the actual battles involved sieges. In the 14th century, English warfare focused increasingly on archery. In fact, Edward III prohibited football in 1331 and then again in 1363 in part because people were spending too much time playing football and not enough time practicing their archery. The English archers were able to repel many a French cavalry force. 10. Only men's sexual pleasure was important. So what was an unmarried woman to do? Well, if she couldn't find a husband, the English physician John of Gaddesden recommended that she find a midwife who could get the job done manually.